What would you like to say to the people,” the narrators asks. “What people?” the man responds. “May God be with you, have a nice meal,” retorts the narrator. Yet, while it is true that some Damascus imams have issued fatwas allowing the consumption of cats and dogs by starving Syrians, and that food is scarce in areas of heavy fighting around the capital, there are many reasons to believe that the video itself was staged in order to gain sympathy for death squad fighters and drum up anger at the Assad government for allegedly keeping food out of those specific neighborhoods. The video is described as having been filmed in a neighborhood that’s under siege by the army, where there’s no food coming in, and no one is allowed out. You would think that in a situation like this, the residents would be starved and weak. But that’s really not the sense I get from these two men in the video: they look healthy, well-dressed, and cleanly-shaved. They really don’t look like they live in a zone where fierce fighting is taking place. I also noticed that they are cooking the cat in a pot that looks quite new. The last part of the video struck me as odd: the man eats a little bit of what is in his spoon – supposedly, the cat – then puts it back down in the pot, though there is still meat in the spoon. This is really not behaviour I would expect from a starved man. There are other strange details in the video. The footage, which is edited in several parts, doesn’t include any wide shots, making it impossible to identify the place where it was filmed – and whether this is indeed a neighborhood where fighting is taking place. The title of the video is also uncharacteristically vague for Syrian activists’ video, describing the location as only “south” of Damascus. It is also interesting to note that the scene in which the cat is killed seems to have been edited out of the video. The video was posted online on October 28. The very next day, October 29, was “National Cat Day” in the United States, which aims to promote the adoption of stray cats. If those who filmed these images wanted to create a buzz in the United States, they couldn’t have chosen a better day. Still, the scarcity of food in contested areas of the country is a very real concern for the people living there. Without a doubt, the assaults being launched by the Syrian army is one contributing factor to the lack of adequate food supply. However, to portray the Syrian army’s attempt to liberate the areas from death squad control as a “blockade” or anything other than a military assault would be dangerously close to propaganda as there is no evidence that the Syrian military is intentionally withholding food from citizens. The death squads, however, are an entirely different story. While propaganda videos have been created to promote the perception that citizens and death squads alike are being forced to eat cats to survive, it appears that the death squads have a somewhat better diet at the expense of the rest of the population of the areas still under their control. Evidence for this can be seen in the recently uploaded video that shows death squad members “capturing” a young boy for “smuggling” food into his neighborhood in Aleppo. NOTE: The translation of this video was provided by Syrian Perspective. In the video, death squad members can be seen threatening and bullying the boy, who was merely attempting to sneak a few packs of chicken into his neighborhood. The boy can be heard saying “take them, take them” to the men surrounding him, obviously in fear for his life and hoping to surrender his food in exchange for it. Such an exchange is interesting indeed since the suffering of the citizens in areas still controlled by the death squads is blamed on Assad by the Western media outlets and the death squads operating inside the country. After viewing this video, however, it should be understood that the death squads themselves are the responsible party for hindering the importation of food to starving citizens. Indeed, even as far back as July, 2013, Reuters was forced to report that the death squads were implementing a blockade against supplies entering certain areas of Aleppo, resulting in thousands of hungry Syrians. The death squads, whom Reuters claims were aiming their blockade against the army, even hung signs in front of their checkpoint outside of Aleppo neighborhood Bustan al-Qasr which read, “"Food, medicine, oil, babies' products, milk, vegetables, meat, bread: completely forbidden (from crossing)." Reuters fails to explain how “babies’ products” would be beneficial to the Syrian military and why these products necessitated a blockade. In the end, the propaganda videos coming out of Syria and produced by the death squads are nothing more than just that – propaganda. 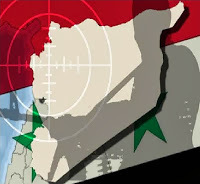 Amidst the atrophy of the death squad forces as a result of the recent American pause of open and heavy funding and a series of political mistakes, as well as the growing victories of Assad’s forces, propaganda attempts are becoming more and more desperate. Indeed, the propaganda narratives surrounding Syria on the part of the Anglo-Americans have always been absurd and there is no reason to expect any abrupt change of tactics.